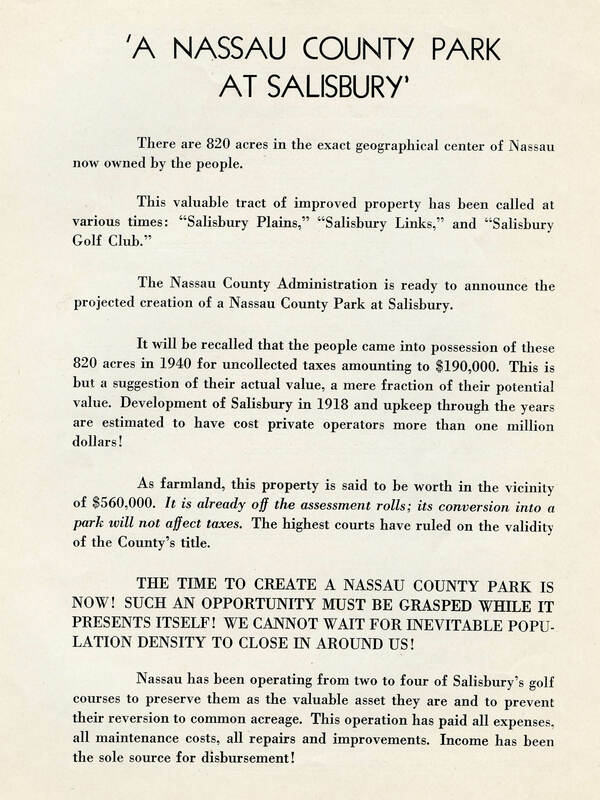 Gary Hammond has forwarded a copy of a rare historic document "A Nassau County Park at Salisbury" proposed by Nassau County Executive J. Russel Sprague in 1944. 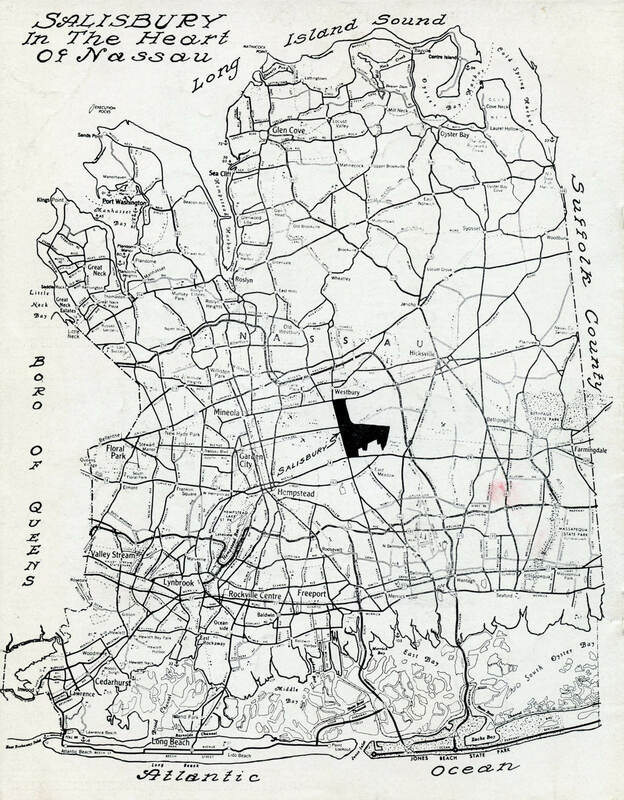 The aerial and map in the document provide insight into the Motor Parkway and East Meadow. The northeast section of the proposed park (now Salisbury Park Drive) bordered on the Motor Parkway right-of-way. 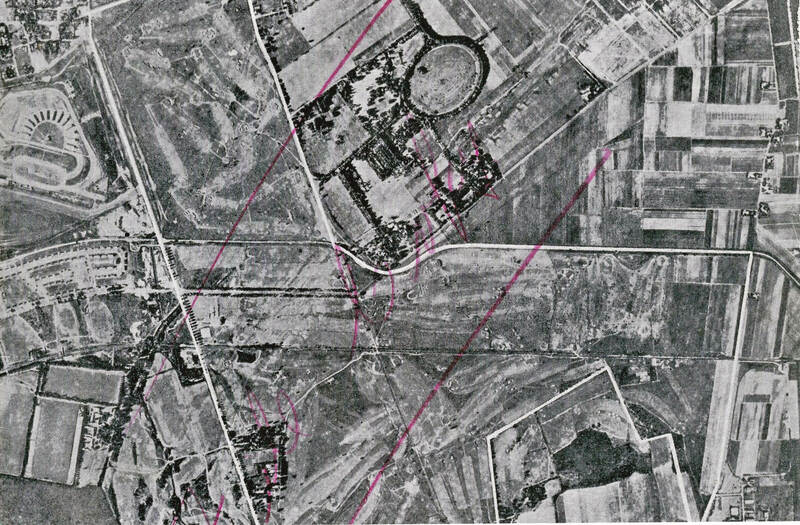 The circular track on the Ladenburg property could still be clearly seen. 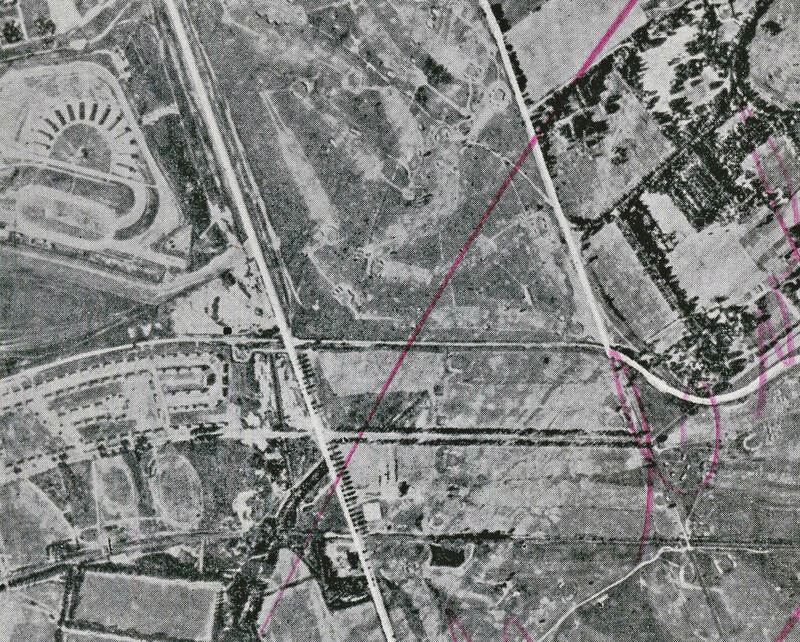 Note how the Motor Parkway paralled Stewart Avenue and the Central Railroad track. 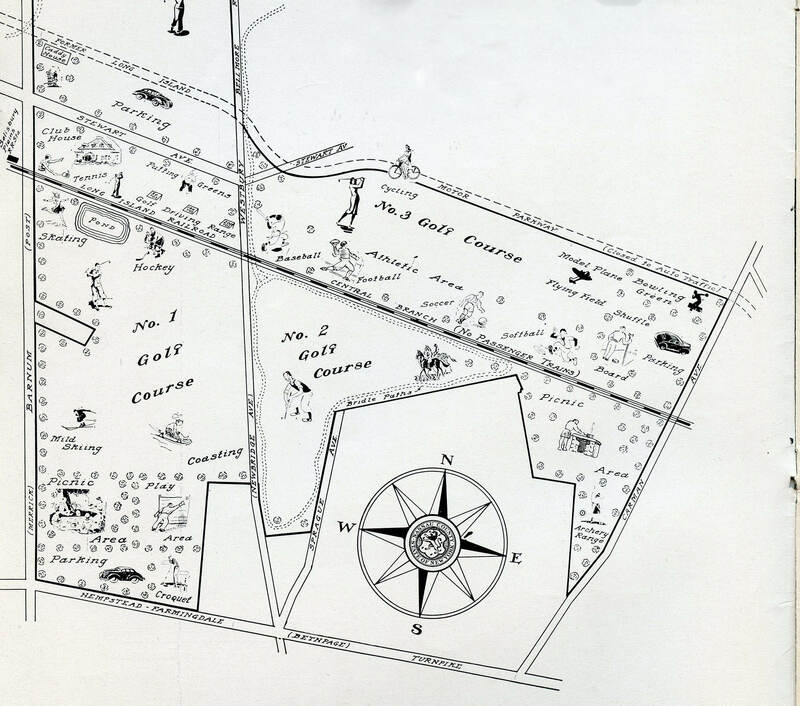 The former keyhole entrance to the Motor Parkway at the Meadow Brook Lodge can be seen west of Merrick Avenue. 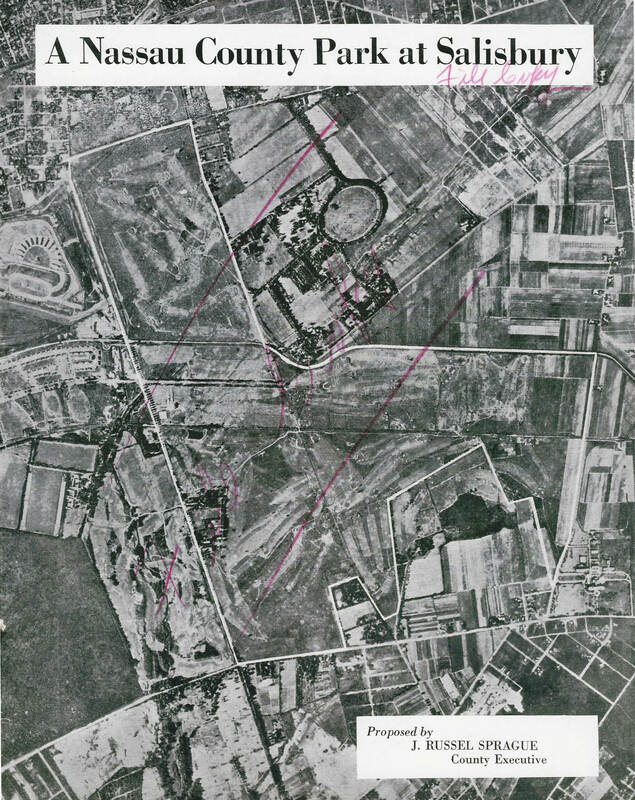 Roosevelt Raceway (top left) was being used for harness racing. 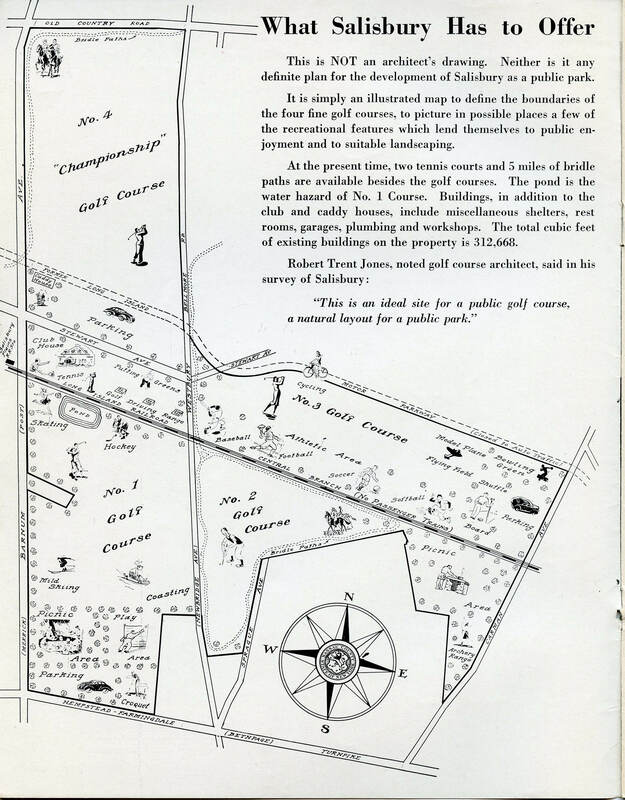 Note the "Former Long Island Motor Parkway" on the top of this section of the map. 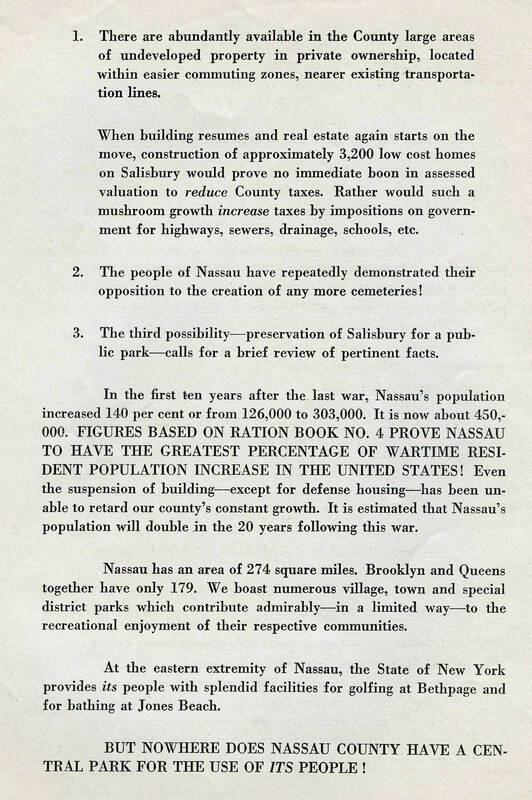 Proposal " A Nassau County Park at Salisbury"
This proposal was written by Nassau County Executive J. Russel Sprague on April 24, 1944. 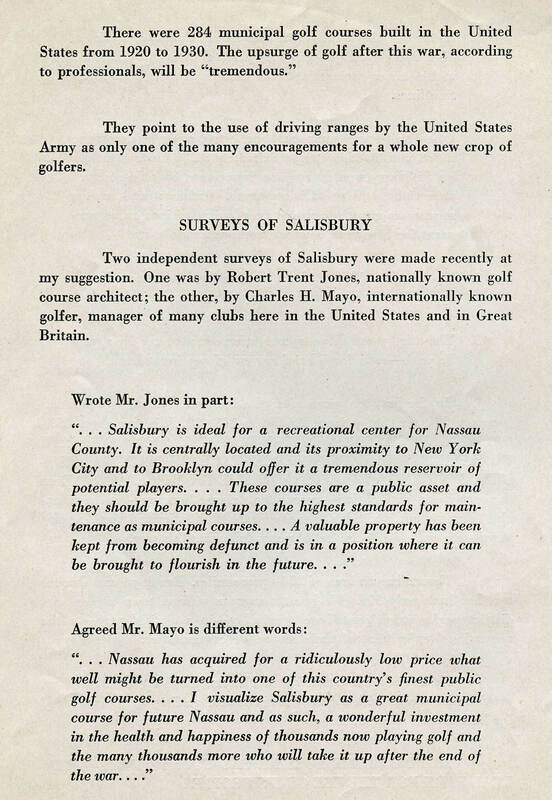 Nassau County owned the 820 acres since 1940 and operating the four Salisbury golf courses. 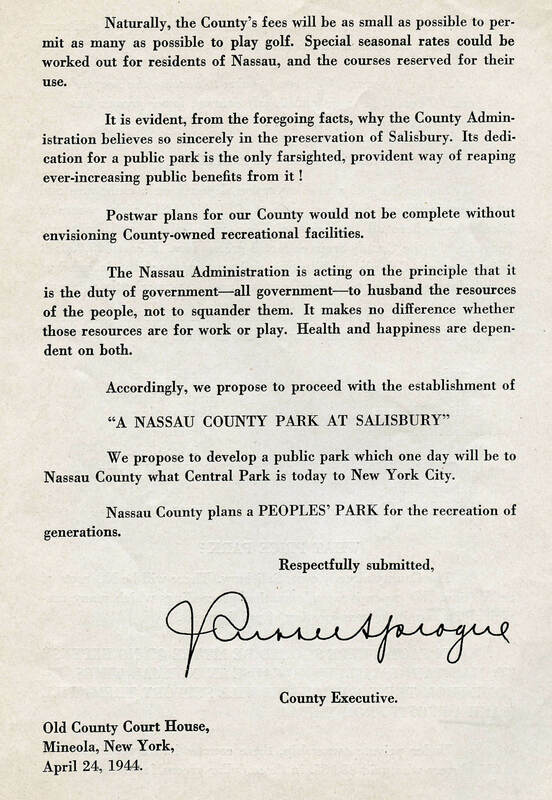 Sprague wanted to develop and expand the property as "a public county park which one day will be to Nassau County what Central Park is today to New York City." 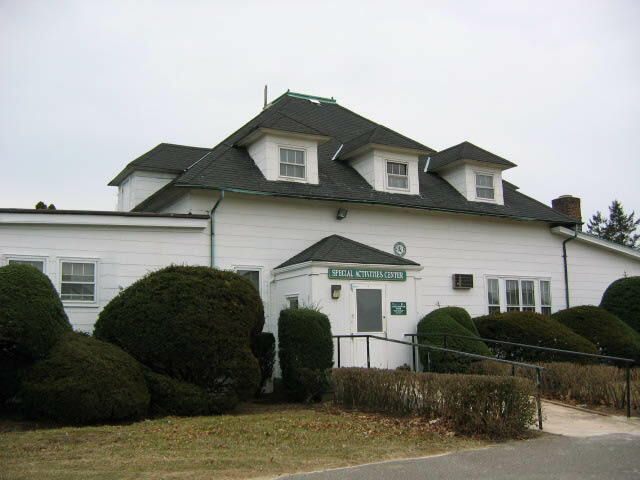 Nassau County had obtained the property in 1940 for uncollected taxes totalling $190,000. 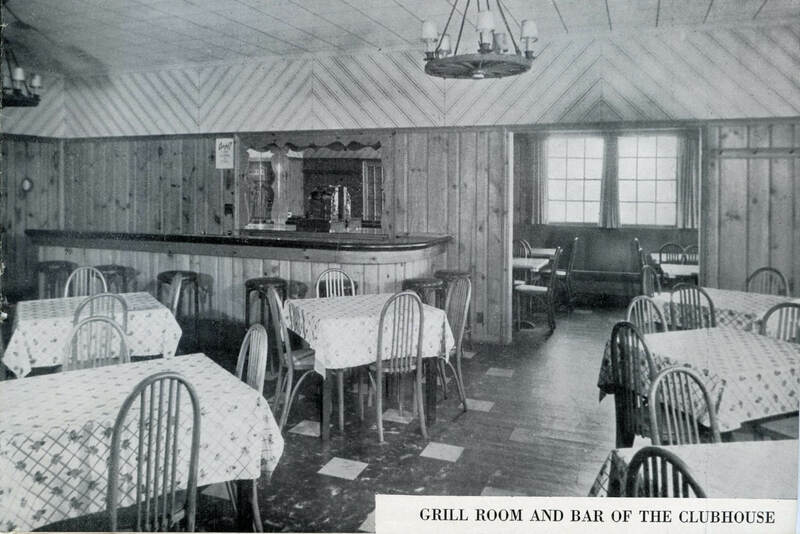 In 1944, they valued the property at $560,000. 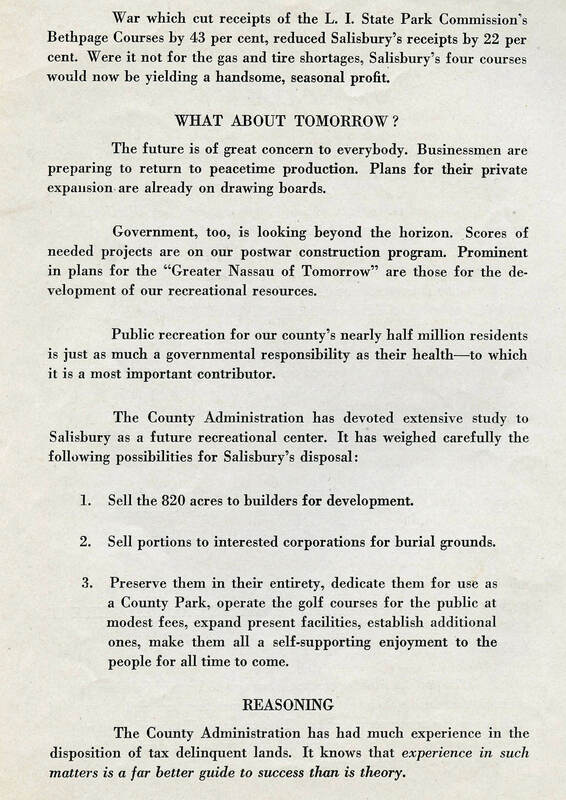 -Develop a county park that will be a "self-supporting enjoyment to the people for all time to come." 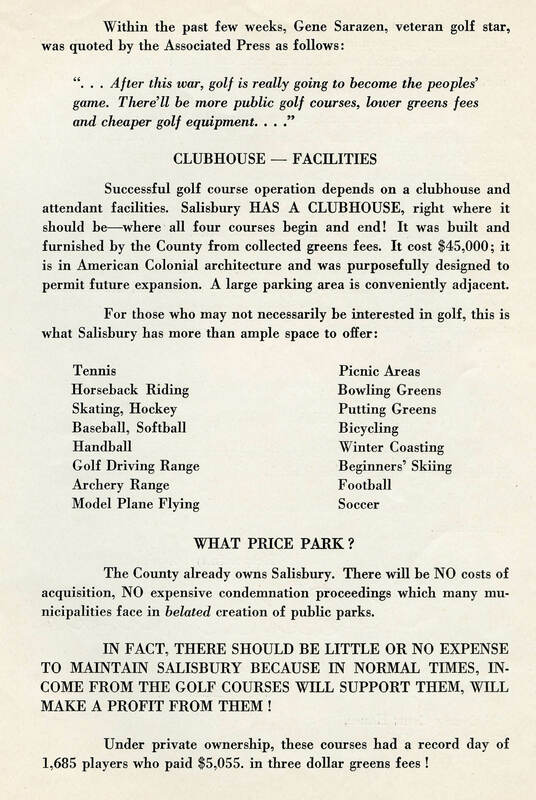 Nassau County built a clubhouse for the Salisbury golf courses for $45,000. 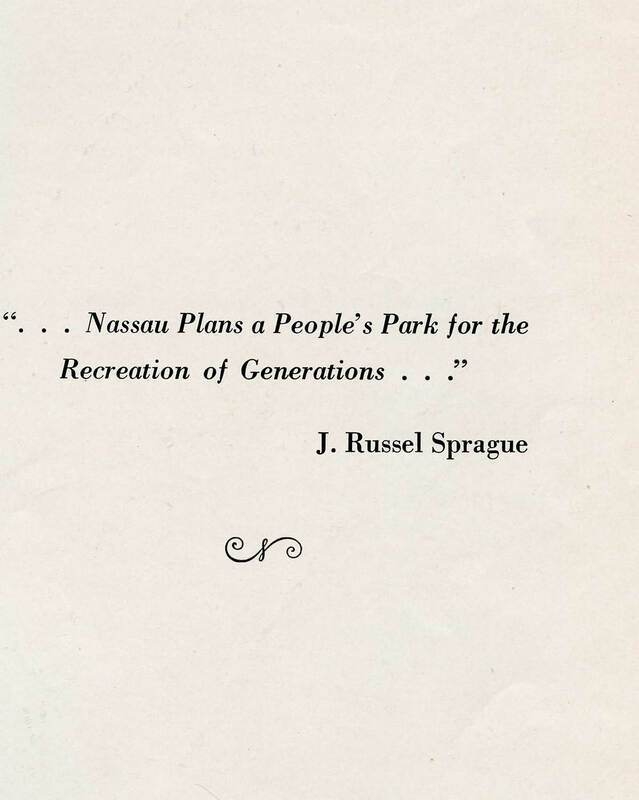 "Nassau County plans a PEOPLE'S PARK for the recreation of generations." 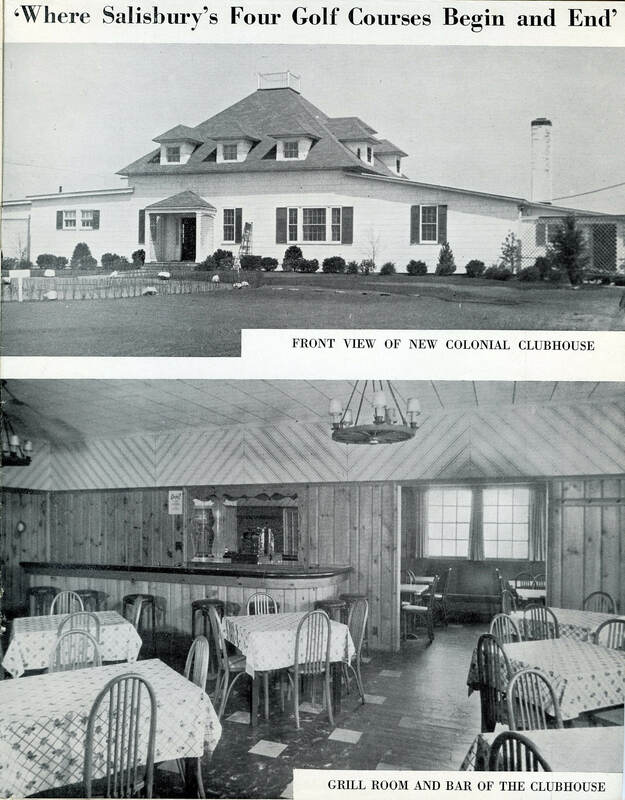 The former Salisbury Clubhouse is still standing and used as a Special Activities Center.